The 2W-MAG is an advanced magnetic contact sensor with integrated RF transceiver designed to be a fully supervised low-current device. A built-in reed switch and/or an external wired input may be applied in this device. 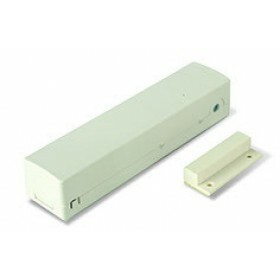 To maximize security, an 8.2K end-of-line resistor is monitored on the external wired input. 2W-MAG uses smart message control, which verifies that all messages are successfully transmitted, so that no intrusion event will be uninformed to the system. Each 2W-MAG has a unique factory set ID code (24bit) which by registration is set into memory of the paired SIM Transceiver, enabling more secured communication and devices to be remotely controlled from a specific transceiver.